lease scroll down for Necklace and Earrings options in precious metals, wood, and acrylic. Choose Sterling Silver or Yellow or White Gold. The pendant is 1.5” in diameter and comes on a matching 18” inch chain. Matching earrings available below. 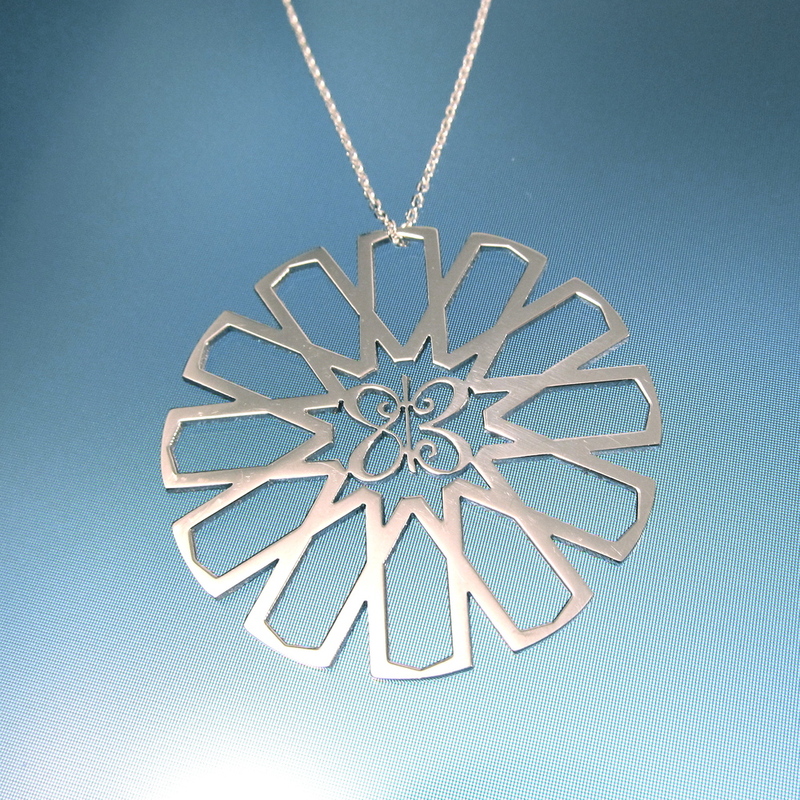 From our Love is My Religion collection, in tribute to Islam, we are proud to highlight the Star of Islam, an ancient Arabic design that can be found in windows and gates of the Holy Mosque in Mecca. We think that’s simply divine. You’ll love the modern, architectural lines. If you look closely, you can see “OM” (One Meaning initials) repeating to form a 12 point star in the center that frames our “floating” butterfly, symbolizing that love is the great connector regardless of religion. Made to order in NYC. Ships in 5 days. Choose Sterling Silver or Yellow or White Gold. Earrings are 1.5” in diameter on gold-filled or silver wires. Matching necklace available above. Statement pieces in high-grade acrylic. The pearlized white positively glows and the super shiny black is cool and chic. These are 2.5” in diameter, and come on an open-ended black cord in 30” so you can self tie to any length you want! Made with love in the USA. Now available in sensual, fragrant, natural Padauk wood just in time for the Summer! Our wood is unstained and unvarnished and kept as natural as possible with just a light oil used in polishing. Statement pendants at 2.5” in diameter. Comes on a casual black cord with open ending so you can adjust the length from 30” to choker. Our model is wearing the Mandala pendant.